Updated Wednesday January 2, 2019 by Chris Mueller. It is my pleasure to present your league with its Certificate of Charter for the Little League® season. 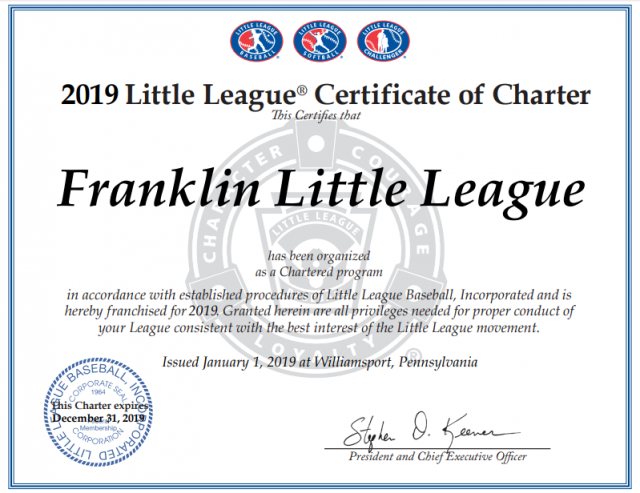 Your acceptance of this charter is a pledge to operate your league in compliance with the terms of this charter and provide a healthy, recreational activity to a new group of families and Little Leaguers® this year. Since 1939, millions of dedicated volunteers around the world have provided the benefits of the Little League program to children in their communities. Little League adult volunteers are entrusted with the responsibilities of developing a fun, well-organized, and healthy environment that supports the social and emotional learning that takes place both on and off the field of play under the Little League banner. Through the sports of baseball and softball, Little League helps prepare children for life through the lessons learned on a playing field. Little League is about more than baseball or softball, it emphasizes the attributes of teamwork, sportsmanship, and self-discipline. We trust that you and your league’s volunteer leaders understand you’re a critically important role in developing tomorrow’s leaders. We thank you, the volunteers in your league, and your community for appreciating the benefits of chartering with Little League Baseball and Softball and wish you all the best for a memorable and fun season.